Young children or the young at heart generally love a pirate-themed party, whether it's to celebrate a birthday -- or just because. 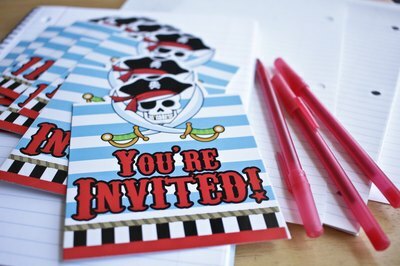 You can immediately set the tone for the event by wording the invitation using pirate lingo. 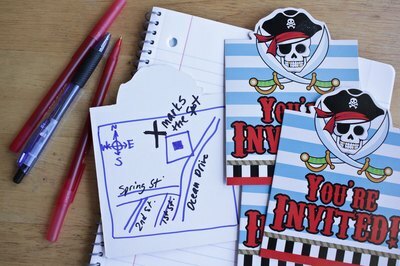 The invitation will still need to convey all the party details clearly, but writing your invite in pirate-speak will give your guests a taste of what to expect and bring a smile to their faces. 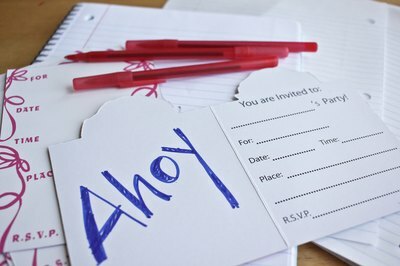 Begin your invitation with a line of welcome, such as "Ahoy!" or "Avast!" Both catch the reader's attention, pirate-style. Get to the business of inviting. Use pirate language to phrase the invitation, such as "Ye be invited to Dylan's Booty Bash" or "Yo ho come 'n join Cap'n Jack at his birthday bash." Add the date, time, and address of the party. You can include a map with directions and write "X marks the spot" next to the location of the party. Relay any pertinent details. 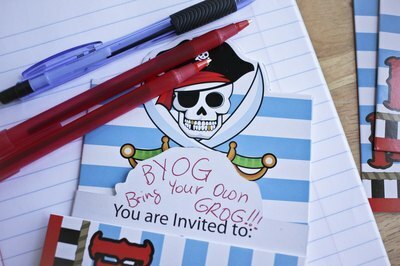 If the event is bring-your-own-beverage, you can state that it is BYOG (bring your own grog). Ask your guests to RSVP. You could write, "Call Joe by January 3 to let us know if your answer is 'aye-aye' or ye'll be walking the plank that day." Or, for an electronic invitation, include "Aye-aye" for yes, "Arr, if I'm done plunderin'" for maybe and "I'm a landlubber" for no.